I’m usually strictly a ‘home party’ person. I do like the control of knowing my venue and having as much time as I need, plus not relying in transporting everything on the day. This year however, Storm Doris took it upon herself to destroy 60% of our fence and the prospect of keeping lively three year olds indoors or risk them escaping our open plan exterior to run up and down the street was not one I fancied. Instead we opted for a mix of a trip to the woods followed by a party tea back at home. We’d planned the party in for the date after getting back from a week away as well, so knowing time was short, the aim was to keep this one simple. The plan: I set off to find our spot in the woods just before the party was due to start in order to set up a tipi, hide some teddy bears, and hang decorations in the trees while the rest of the family waited at home. The children arrived and selected an ‘adventure headband’ I’d made using elastic and a few feathers then walked down at 3 year old pace to find us in a little clearing. I’d picked a spot by the water, checking that parents felt ok about that first, and and warned them to bring wellies. They happily spent the first few minutes playing with sticks and running around. 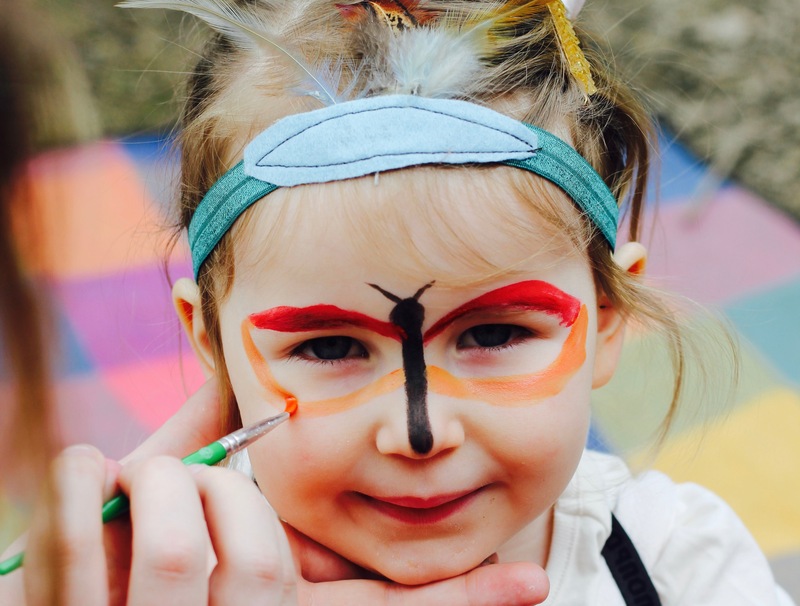 It was great to have an arty friend come along to help so I assigned Hannah to face-painting and set up a little blanket by the tipi for the children to sit one by one and be painted as butterflies (or rhinos, unicorns or batman… of course) We kept the activities simple. I had cut out butterfly shapes on white card and attached pipe cleaners and a thread to hang them from the trees. I took small pots of paints and brushes along and the children could pick one at a time to paint one side and splodge over to print onto the other wing then leave them drying on their spot in the trees until it was time to head home. We took a little bluetooth speaker and used it to play pass the parcel. After games I told the children that there were some little bear friends lost in the woods and that they were hoping to be found by a new family. I’d bought a set of these beautiful bears from a wholesaler on eBay and I tied each one a different colour ribbon around it’s neck so that there would be no arguments about who’s was who’s when we got back to the house. We’d hidden them around the spot we were using, up trees, behind rocks, in the grass and all the children went to find one to keep. While they were looking for bears with their parents I headed off first to set out the party tea, leaving Holly (my 12 year old) who had hidden the bears behind incase anyone was really stuck, and once the children arrived back and de-muddified their hands we sat up to tuck into pizzas, Pom Bears, crunchy veggies and bread sticks. For pudding I did small pots of natural yogurt with chopped fruit to add in and some pretty rice-crispy squares with edible glitter for a bit of sparkly fun. I arranged the bits and pieces for party bags onto the shelves in our kitchen. Having it out on display is an easy way to include another themed decoration and helps me to keep the things I’m going to add in on the classy rather than tacky side. We popped in their bear hunt bear, a Butterbear bath bomb from Lush, some cake, and a bag of trail mix. Trail mix is a great way to keep party bags low sugar but still containing a bit of chocolate. I added in some chocolate buttons, chocolate pieces and mini marshmallows along with monkey nuts and alphabet cereal and tied these in a little bag just with handwritten labels. For the cake I did a 3 layer chocolate cake and used this big Meri Meri no. 3 candle and some of our fave Shleich bears. After considering crafting some little trees I saw this fab idea of using rosemary on @buttercreamanddreams Instagram and, well, we have a forest of rosemary taking over the back garden. Thankfully the day ended with some tired happy kids and a content newly three year old. This is despite the breakdown the day before. Even though she had decided 6 months ago it was a butterflies and bears party she wanted, talking about it constantly from November through to April, With less than 24 hours to go she decided she’d actually like to change it to a bouncy balls and Peppa Pig party. Fabulous. And no.